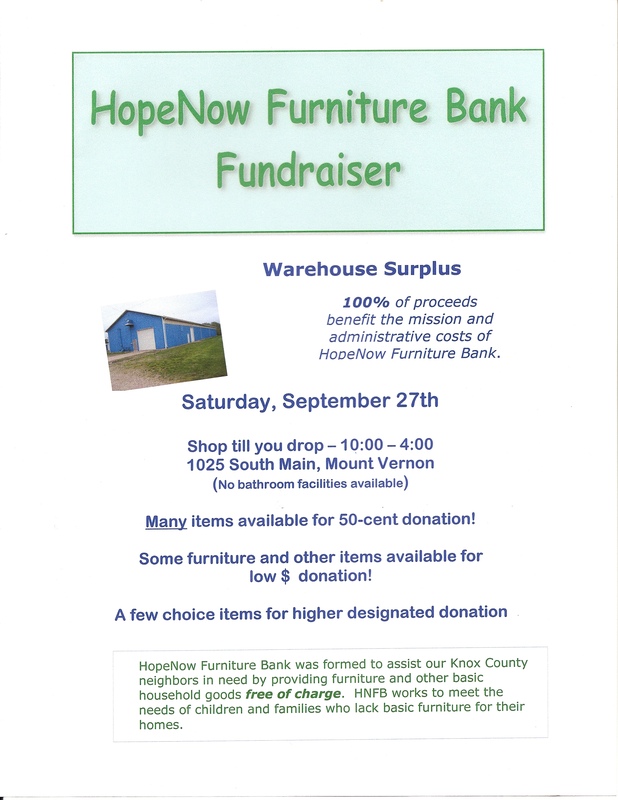 Warehouse surplus items will be offered for a donation at a public event on Saturday, September 27th. All proceeds from this event will benefit the mission and administrative costs of HNFB. Many items will be available for a 50-cent donation. Some furniture and other items will be offered for a small dollar-amount donation. There will be a few choice items for which we will request a higher designated donation. Come on out to the warehouse at 1025 South Main on Saturday the 27, 10:00 – 4:00p.m. Your donations will not only give you something to take home but will also assist our Knox County neighbors in need by providing furniture and other basic household goods to them free of charge. Cleaning and reorganization work continues at the warehouse the remainder of this week. We will reopen and resume the regular schedule on Tuesday, September 2 at 1:00 p.m. for scheduled appointments or small drop-off donations. For large donations, please call 740-358-2998. The work at the warehouse continues the rest of this week and so we will remain closed. Lots of cleaning and reorganization is being done. We are soon going to begin work on a furniture repair workshop at the back of the warehouse and we need to prepare for that. We are also putting aside lots of “surplus” items which we will offer for donation at a special event on Saturday, September 27. Watch for further notice about this event. Reopening date for the warehouse is Tuesday, September 2 at 1:00 for those with appointments or small load donations. We’re taking a break! HopeNow Furniture Bank warehouse will be closed for maintenance and reorganization from August 15th through August 26, or until further notice. Please watch for an announcement of our regular schedule resuming! HopeNow Furniture Bank warehouse will be closed for maintenance and reorganization from August 15th through August 26th, or until further notice. Please watch for an announcement of our regular schedule resuming!